Nepal is the newest destination of AirAsia MY. They donâ€™t have fly-through flights yet but here are new destinations you can fly-thru hassle-free! Philippinesâ€™ AirAsia adds Bali, Bangkok, Phuket and other ASEAN tourist destinations to its Fly-Thru network! Philippinesâ€™ AirAsia just launched its new Fly-Thru service from Clark International Airport to top tourist destinations in Thailand, Indonesia and Singapore. The new service offers guests more convenient transit process, hassle free luggage check-in and other connecting convenience from Clark airport to Bali, Jakarta, and Surabaya in Indonesia; Bangkok and Phuket in Thailand and Singapore. To celebrate the new Fly-Thru routes, AirAsia offers all-in promo fares from as low as Php3,149 for Singapore, Php3,859 for Phuket, Php4229 for Bangkok and Surabaya, Php4,439 for Jakarta and Php4,729 for Bali. The promo starts July 30 until August 5 only and guest will be able to travel from November 1- January 31, 2013. The Fly-Thru service was introduced by AirAsia last year with connecting flight options from selected destinations in the AirAsia route network which spans across 20 countries and 80 destinations. It allows guests to seamlessly connect on multiple flight legs, on certain flights without needing to pass through immigration, collect bags, re check-in between flights or have a transit visa. Bags will also be automatically checked through to the final destination. Guest who will avail of the Fly-Thru service will be charged with a minimal fee of Php900 only which will already be included in the all-in fare upon booking via airasia.com while connecting time is expected to take less than 5 hours. All connecting destinations will come from AirAsiaâ€™s transit point in LCCT (Low Cost Carrier Terminal) in Kuala Lumpur. The Filipino carrier has recently launched its first Fly-Thru service to Gold Coast, Melbourne, Perth and Sydney in Australia and Osaka-Kansai in Japan. 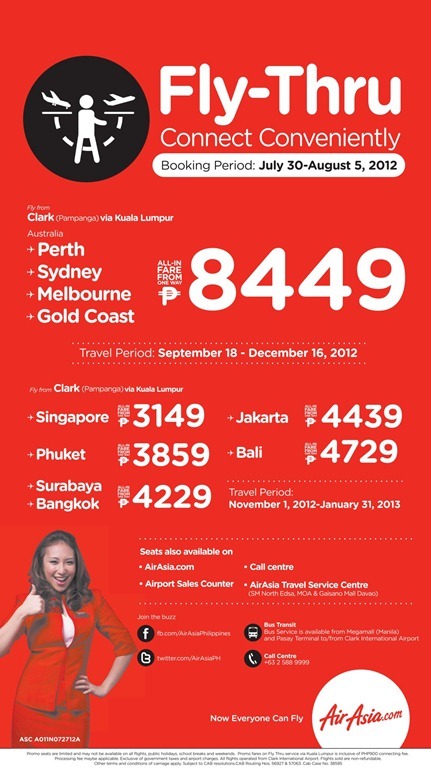 Promo fare is also being offered beginning July 30 until August 5 for as low as Php8,449 for all Fly-Thru service from Clark airport to Australia with travel period from September 18 â€“ December 16, 2012. To get the latest bargain deals follow Philippinesâ€™ AirAsia on Facebook and Twitter. Philippinesâ€™ AirAsia call center also accepts booking of regular fares via +632 588 9999 from Monday to Sunday at 0800hrs to 2100hrs (GMT +8). Guests from Metro Manila may also purchase seats through AirAsia Travel Service Centers (ATSC) located in SM North Edsa in Quezon City and in Mall of Asia in Pasay City. my name is bagus victory, just call me bagus. I am balines I am make tour service with 12 years exsperiance at travel agent in Bali, became driver, guide and staff also. my tour organiser name Victory Tour with victory you can exsplore bali with the real tour,cheap price and sure with good service. I hope the tourist can selected when they choise: bali tour organiser,for they traveling so their can enjoy for the bali tour,bali adventure.and never forget bali with island of god,and than you can recomend with your family ,your friend for coming to bali for holiday and ofcourse dont forget bali tour and victory tour second home in bali for enjoy the beautiful of Bali.